By August 1940, Germany occupied much of mainland Europe, from the Scandinavian countries in the north to France in the south, leaving Britain isolated against the Nazis. Only the English Channel prevented the expected invasion. Hitler knew that if he were to get his troops safely across the water, he would first have to defeat the Royal Air Force (RAF). The British had lost about half their fighter aircraft during the retreat from France and were greatly outnumbered by the German air force, the Luftwaffe. Hitler had planned to invade Britain on the 13th August 1940 but the RAF was still to strong a fighting force. On this day, the Germans launched a powerful air offensive on bases and communication networks in southern England. About 100 enemy aircraft headed towards Kenley and neighbouring Biggin Hill airfields on a high level raid. Meanwhile, nine Dornier Do17 bombers came in low and attacked Kenley, destroying three hangars, the medical quarters and ten planes on the ground. One officer and eight RAF men were killed, with eight others injured. Fortunately, the operations room was left standing. The Germans had studied aerial photographs of Kenley and knew their targets. Their Dornier aircraft were equipped with cannons and bombs, specially designed for low level attack. Kenley was defended by anti-aircraft guns positioned around the airfield’s perimeter track. The most effective of these was the Bofors gun. Another innovative defence measure was the parachute and cable system. Rockets were fired into the sky, trailing behind them a steel cable, which was suspended for a few seconds from a parachute. The drag of the parachute would bring down any aircraft that came into contact with the cable. On the 18th August, the system was fired, but just one Dornier was brought down. The burning plane was found by Air Warden Reid, who witnessed the crew die in the flames. Of all the German bombs dropped that day, only a few actually reached their target. Many fell on the surrounding towns. 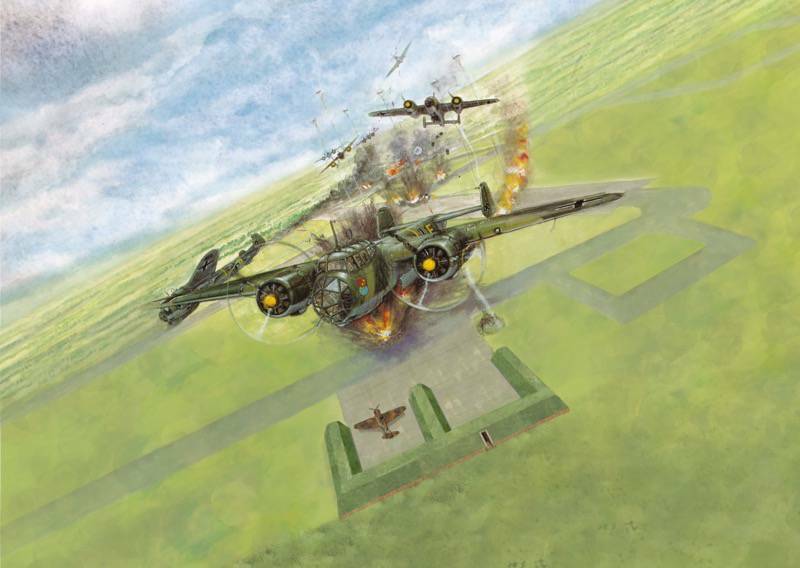 For both Kenley Airfield and the country this series of attacks became known as ‘the hardest day’. After the raids, civilians and military personnel struggled frantically to put the airfield back into working order. In testimony to their dedication, it was serviceable the following day.